A couple of years ago Mason Edwards created two super posters of the Royal Liverpool Golf Club and Hoylake station. 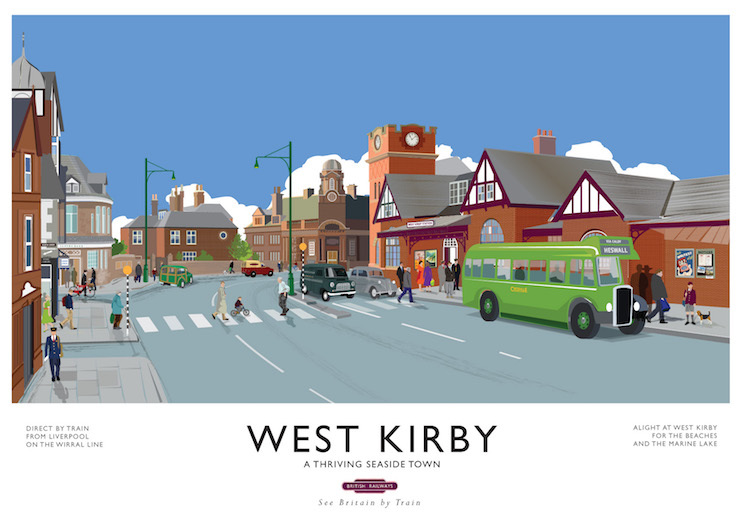 Now Mason has now turned his attention to our neighbours at the end of Meols Drive and produced this lovely railway poster of West Kirby station. Prints of the poster are now available from Seagrass Studio in Acacia Grove, West Kirby. If anyone has any photos of original railway posters of either Meols, Hoylake, West Kirby or the old Hooton line (now the Wirral Way) please do get in touch as I’d love to see them. Hello John. It is a wonderful print. We have already had an order to send one to Canada as a result of your post. It’s very kind of you. Many thanks. With warmest regards, Jo @ Seagrass. Could this really be my old childhood chum? I have been in Canada since 1972 as a dentist! What a lovely poster – I think I shall contact the Studio and see about getting one, I was born and bred in West Kirby (WeKa) and this poster nearly brought tears to my eyes and a touch of homesickness after 40 plus years!! Please advise should anything in a similar vein come along.